There are 23 Assisted Living Facilities in the Hamilton area, with 5 in Hamilton and 18 nearby. The average cost of assisted living in Hamilton is $3,650 per month. This is higher than the national median of $3,346. Cheaper nearby regions include Fairfield with an average starting cost of $2,600. To help you with your search, browse the 170 reviews below for assisted living facilities in Hamilton. On average, consumers rate assisted living in Hamilton 3.2 out of 5 stars. Better rated regions include Fairfield with an average rating of 3.6 out of 5 stars. Caring.com has helped thousands of families find high-quality senior care. To speak with one of our Family Advisors about assisted living options and costs in Hamilton, call (855) 863-8283. Hamilton is about 20 miles north of Cincinnati and has a population topping 62,000. It is home to the Pyramid Hill Sculpture Park & Museum with more than 60 huge outdoor sculptures. The city has four assisted living facilities, with an additional 34 in surrounding areas such as Fairfield and Cincinnati. 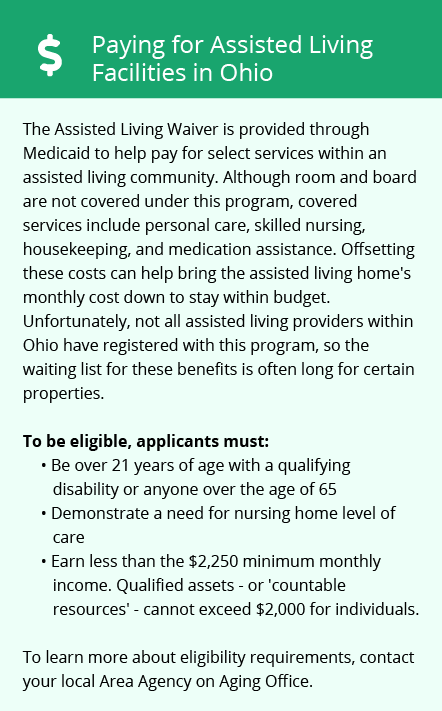 Residential care facilities are licensed by the Ohio Department of Health. These facilities generally provide accommodations, supervision and personal care for at least three unrelated people living in them. The cost of living in the Cincinnati area is about 8 percent lower than for the United States as a whole. Folks living in the region can expect to pay less in categories such as health care and utilities. The Pyramid Hill Sculpture Park & Museum is in Hamilton, and each visit can feel like a different experience. The city also boasts the Conservatory at Miami University Hamilton, the Fitton Center for Creative Arts and the Butler Philharmonic. Parks include Four Mile Creek MetroPark for activities such as walking and fishing, and Gilmore MetroPark for bird watching. Hamilton is safer than 3 percent of U.S. cities and has a violent crime rate of 5.15 per 1,000 residents. The rate in Ohio is 3 per 1,000, meaning that your chances of being a violent crime victim in the state are about 1 in 333. In Hamilton, they increase to 1 in 194. The United States averages 54 out of 100 on the Sperling’s Comfort Index, with 100 being the ideal climate. Hamilton scores 44 out of 100 and may be uncomfortable for some seniors during certain times of the year. Hamilton has fairly cold winters, with an average January low of 23 degrees. It gets about 13 inches of snow a year, significantly lower than the nationwide average of 26 inches. Unfortunately, Hamilton also gets fewer sunny days than average, 177 compared with 205 for the country. This could limit the amount of time seniors spend outdoors. The Butler County Regional Transit Authority provides transportation in the area. Senior citizens 65 or older can pay half fares and must fill out an application. Assisted Living costs in Hamilton start around $3,650 per month on average, while the nationwide average cost of assisted living is $4,000 per month, according to the latest figures from Genworth’s Cost of Care Survey. It’s important to note that assisted living rates in Hamilton and the surrounding suburbs can vary widely based on factors such as location, the level of care needed, apartment size and the types of amenities offered at each community. Hamilton seniors may qualify for programs such as the Residential State Supplement Program to help supplement their assisted living costs. 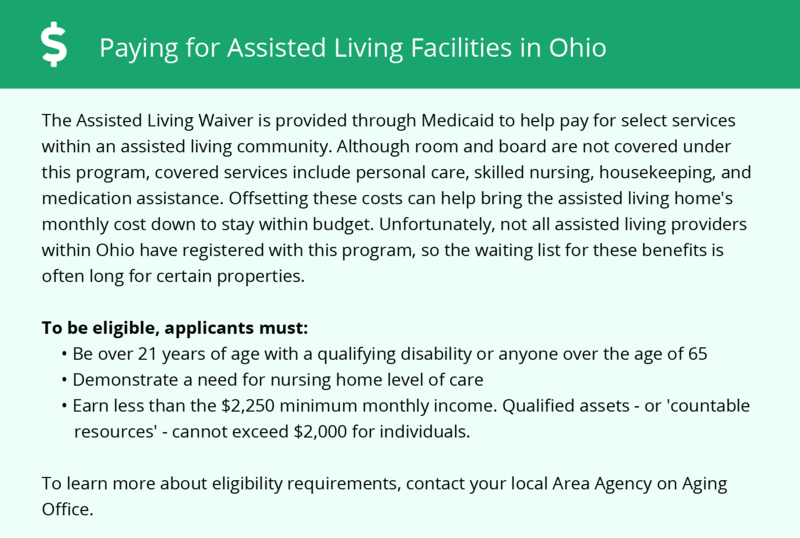 Some seniors might be eligible for assisted living assistance through Medicaid waiver caps, MyCare or the 1915(c) Assisted Living Program. Hamilton and the surrounding area are home to numerous government agencies and non-profit organizations offering help for seniors searching for or currently residing in an assisted living community. These organizations can also provide assistance in a number of other eldercare services such as geriatric care management, elder law advice, estate planning, finding home care and health and wellness programs. To see a list of free assisted living resources in Hamilton, please visit our Assisted Living in Ohio page. Hamilton-area assisted living communities must adhere to the comprehensive set of state laws and regulations that all assisted living communities in Ohio are required to follow. Visit our Assisted Living in Ohio page for more information about these laws.